The state should aggressively expand staffing for public safety, including Troopers, VPSOs, prosecutors, support staff for those respective departments, and with municipal revenue sharing that directly supports the Anchorage Police Department. Cuts to the police and prosecutor workforce, in conjunction with the opioid epidemic and reduced penalties for property crime, have led to an explosion of crime. It is time to fight back with more cops, more prosecutors, more behavioral health treatment (including expanded capacity for residential and out-patient treatment), and legal reforms to strengthen penalties for criminal behavior. The legislature should support efforts by health care providers to integrate addiction treatment with emergency room care. We also need to improve early childhood care to reduce the incidence of adverse childhood experiences and trauma, which are closely correlated with susceptibility to addiction. I strongly support stronger penalties for sexual assault, and closing loopholes to ensure that perpetrators like Justin Schneider are never released without a significant jail sentence. We should also examine policies other states have used to reduce violence associated with substance misuse. Finally, we must expand API's capacity and staffing to keep people with severe mental health issues off our streets and out of our hospital emergency rooms. I am honored by the Anchorage Central Labor Council's support in this campaign, and the support of many union locals. Alaska has been a pro-labor state since adoption of our Constitution, and we should build on that legacy. In addition to adhering to long standing policies like prevailing wage laws, the state must act aggressively to restore economic security for working families whose livelihood has become more perilous as a result of gig employment, outsourcing, and other aspects of what economists call the “fissured” economy. As a start, the legislature should establish the equivalent of unemployment and retirement benefits for independent contractors. Since far-right ideologues on the U.S. Supreme Court are attempting to gut public employee unions with the Janus decision, the state should examine all options to sustain public employee unions that have always helped maintain our infrastructure and run state government. Inadequate state revenue has drained state savings and hollowed out the state capital budget. 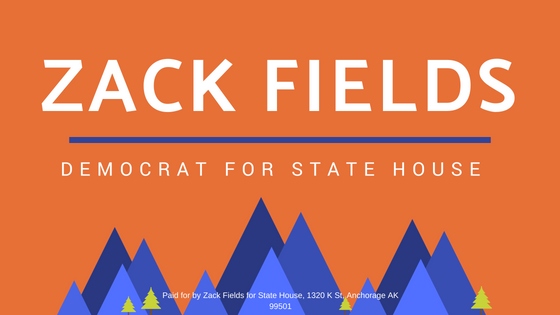 As I've told people since the first day of this campaign, I support higher taxes on oil production and/or a progressive income tax to balance the state budget and fund core public services. Alaska has always relied on a robust capital budget to provide adequate infrastructure and sustain our middle class. Restoration of the capital budget, with a focus on projects that enhance Alaska’s competitiveness, should be a top priority. Alaska’s public employees serve the state under what are often harsh working conditions and long hours. Public service should be honored and encouraged, and it is past time for the state to restore a defined benefit pension for public employees, and--at a bare minimum--to ensure employees receive raises at least equal to inflation. In addition, the state should take action to support families with children, including through provision of paid parental leave. As I've told people since the beginning of this campaign, I support either higher oil taxes and/or a progressive income tax to balance the state budget and fund core public services. We should also examine creative revenue sources such as putting a price on carbon pollution and reinvesting that in deficit reduction, expansion of PFDs, and renewable energy/efficiency investments. The choice here is simple: Either we raise sufficient new revenue to fund core services, or the PFD will be cut when we run out of state savings. It is dishonest to campaign against new revenue while claiming to support the PFD. We can't save the PFD--which has a long record of reducing inequality and reducing poverty in Alaska--without a sustainable budget that includes new revenue. I'm honored to be endorsed by Planned Parenthood Votes Northwest and Hawaii. We must defend the basic principle that all Alaskans have the same legal rights regardless of their gender, race, or sexual orientation. Specifically, I oppose any government restriction of women’s ability to make their own decisions about when an abortion may be necessary. The notion that women should have radically less reproductive freedom than men is odious, and has no place in a civilized society. Similarly, we must continue to fight back against efforts to legalize or encourage discrimination on the basis of sexual identity. I was proud to work alongside countless other Alaskans who defeated Proposition 1, an attempt to mandate discrimination against transgender individuals. I have also worked to help defend judges who were targeted by anti-woman groups after those judges upheld laws protecting women’s reproductive rights. I appreciate the Alaska Center's endorsement in this campaign. Climate change and ocean acidification pose an existential threat to Alaska’s fishing industries and the rural and coastal communities that depend on marine resources. The state’s continued financial dependence on oil revenue should not be an impediment to emissions reductions policies and programs. These should include integration of regional electric grids to enable expanded use of renewable power, expansion of state support for renewable rural microgrids, and actions to reduce costly energy use from state buildings and emissions from its vehicle fleet. In addition, the state should join with other governments in a regional (or broader) cap and trade program to drive down emissions in the most cost-effective manner possible. The state needs to reform its approach to transportation and ensure infrastructure investments prioritize safe streets that spur economic development while improving public safety. For instance, Anchorage’s auto-centric roads--many of which lack adequate pedestrian and bike facilities--are an impediment to economic development, because they discourage movement by residents and tourists through downtown and other main thoroughfares. In addition, Alaska should build on its lucrative outdoor recreation economy and expand both trail infrastructure and marketing to enhance tourism visitation and revenue from hikers, mountain and snow bikers, backpackers, paddlers, and other adventure tourists, an industry that already generates $337 million in state and local tax revenue and 72,000 direct jobs, with opportunity for growth. As the state’s single largest employer, the fishing industry is essential to the economic vitality of Alaska’s communities, supplying more than 100,000 jobs and $5 billion in wages. Salmon also play a vital cultural role for Alaskans both today and throughout Alaska’s history. To preserve Alaska’s globally significant salmon and seafood resources for future generations, we must update Alaska’s outdated fish habitat laws. Without these reforms, the state would gain the funds and policy framework to deny permits for economically, environmentally, and culturally destructive projects such as Pebble Mine, along with the ability to green-light the vast majority of projects that can be built without impacts to salmon habitat. Specifically, Alaska state statute should better define salmon habitat; adequately list the state’s salmon-bearing streams; provide “salmon safe” development guidelines; and give Alaskan citizens adequate opportunity for participation in decisions regarding development that could impact salmon resources. Against all odds, more than 200 tribes of Alaska Natives have survived a multi-century campaign of cultural genocide waged first by the Russian, and then by the U.S. governments. From enslavement to kidnapping to sexual abuse to language annihilation, Alaska Natives have confronted and survived horrors without equal on this continent. Governments today have an obligation to acknowledge this history and do everything possible to atone for the sins of previous elected officials and administrations. Beyond that, it is in all of our interests--whether we have indigenous ancestry or not--to preserve and celebrate the languages and cultures that make Alaska such a rich place to live. The state should undertake comprehensive efforts to preserve the multiple Alaska Native languages that are in dire risk of extinction. Expanded support for multilingual and immersion programs in schools, and expanded use of Alaska Native languages in state materials are a starting point to reach this objective. The state should continue to expand efforts to partner with tribes on law enforcement and administration of the justice system. For too long, Republican administrations contested tribe’s inherent sovereignty, and we now must make up for lost time. Only by partnering with tribes can the state and tribal governments ensure an acceptable level of public safety in rural communities. The state should also recognize, honor, and protect traditional ways of life such as hunting, fishing, and berry picking. More than mere “subsistence,” these are an integral and essential part of Alaska Native culture. Alaska Native Corporations are a cornerstone of the state’s economy, generating billions of dollars in wages and shareholder dividends. Both village and regional corporations provide important job opportunities that would otherwise be unavailable for working class Alaskans. In addition, many corporation’s subsidiaries are partners in Joint Apprenticeship Training programs with Alaska unions, further expanding the public benefits associated with Native corporations’ job creation. The state must continue to support the impressive system of tribal health and non-profit providers that provide health care and other essential services across Alaska. These organizations are central to our health and economic well-being, and the state should look for opportunities to expand services such as behavioral health, neonatal and early childhood care, and for other pressing needs. Finally, the state has an obligation to protect Alaska Natives’ voting rights, including by providing voting rights materials in Alaska Native languages and by ensuring all rural communities have accessible polling locations. The state must also ensure poll workers have training to oversee polling places and assist Alaska Native language speakers who need voting assistance. I'm honored by support of Alaska Native leaders including Barbara Donatelli, Heather Kendall-Miller, Vickie Otte, Greg Razo, and others.